Obama Baltimore press conference: President's comments on police and poor more pointed than usual. 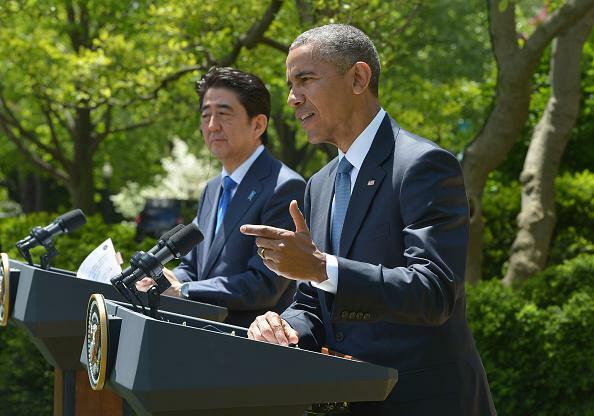 President Obama and Japanese Prime Minister Shinzo Abe at Tuesday’s Rose Garden press conference. Fielding a question about Baltimore during a press conference with Japanese Prime Minister Shinzo Abe, President Obama spoke at length about crime and police brutality Wednesday. Obama condemned Monday night’s rioting and expressed sympathy with injured officers, but also called the persistence of police violence across the country “troubling” and cataloged the systematic failures that seemingly make such issues inevitable. It was an unusually stark and perhaps even pessimistic take coming from Obama, whose statements on other recent police issues have tended to be fairly conservative and evenhanded—and whose political image is, of course, built on hope and optimism. Subsequently, though, Obama pivoted to a broader discussion of the backlash against police violence, and his tone became sharper. The violence that happened yesterday distracted from the fact that you had seen multiple days of peaceful protests that were focused on entirely legitimate concerns of these communities in Baltimore, led by clergy and community leaders. And they were constructive and they were thoughtful. And frankly it didn’t get that much attention. And one burning building will be looped on television over and over and over again, and the thousands of demonstrators who did things the right way, I think, have been lost in the discussion. Since Ferguson and the task force that we’ve put together, we have seen too many instances of what appears to be police officers interacting with individuals, primarily African-American, often poor, in ways that raise troubling questions. And it comes up, it seems like, once a week now. Or once every couple of weeks. And so I think it’s pretty understandable why the leaders of civil rights organizations, but more importantly moms and dads across the country, might start saying, this is a crisis. What I’d say is, this has been a slow-rolling crisis, this has been going on for a long time. This is not new and we shouldn’t pretend that it’s new. Discussing the administration’s work reforming local police departments—including race-related retraining and grants to purchase body cameras—Obama challenged “organizations like the Fraternal Order of Police and other police unions” to acknowledge that incidents of violence against unarmed suspects are “not good for police. … There’s some police who aren’t doing the right thing.” He detailed problems in low-income neighborhoods including inferior schools, drug addiction, unjust sentencing, the so-called school-to-prison pipeline, and the decline of manufacturing jobs—and suggested that the largest problem of all is public disinterest in the conditions of poor communities. We can’t just leave this to the police. I think there are police departments that have to do some soul-searching, I think there are some communities that have to do some soul-searching, but I think we as a country have to do some soul-searching. This is not new. It’s been going on for decades. In those environments, if we think that we’re just going to send the police to do the dirty work of containing the problems that arise there, without as a nation and as a society saying ‘what can we do to change those communities, to help lift up those communities and give those kids opportunity?’, then we’re not going to solve this problem. And we’ll go through the same cycles of periodic conflicts between the police and communities, and the occasional riots in the streets, and everybody will feign concern until goes away and then we go about our business as usual. If we are serious about solving this problem then we’re not only going to have the police, we’re going to have to think about what can we do, the rest of us. If we really wanted to solve the problem, if our society really wanted to solve the problem, we could … it’s just it would require everybody saying ‘this is important, this is significant.’ And that we don’t just pay attention to these communities when a CVS burns. And we don’t just pay attention when a young man gets shot or has his spine snapped. That we’re paying attention all the time because we consider those kids our kids and we think they’re important and they shouldn’t be living in poverty and violence … That kind of political mobilization, I think we haven’t seen in quite some time. And what I’ve tried to do is promote those ideas that would make a difference, but we all understand that the politics of that are tough because it’s easier to ignore those problems, or to treat them just as a law and order issue as opposed to a broader social issue. That was a really long answer. But I felt pretty strongly about it.